Forbidden Fruit is an indica dominant hybrid strain created through a cross of the insanely delicious Cherry Pie x Tangie strains. It’s name may say it’s forbidden, but you’ll be tempted to have more and more after one tasty morsel of this delicious bud. The Forbidden Fruit flavor is incredibly smooth and fresh, with a fruity sweet lemony taste that’s accented by sweet berries and pine. The aroma is very sweet as well, with a pine overtone that’s complemented by lemony berries and earth. 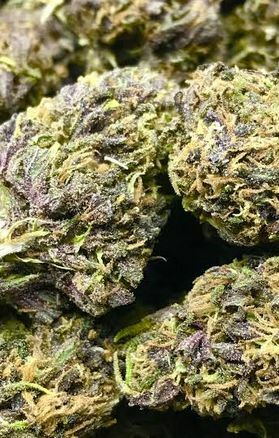 Forbidden Fruit buds have dense pebble-shaped dark forest green nugs with sparse orange hairs and a thick frosty coating of minty green crystal trichomes. If you like the taste of Forbidden Fruit, you’ll love the high even more. It starts with an uplifted euphoric effect that boosts your mood and leaves you feeling happy and content. As this head high continues, your body will fall victim to a powerful stone that leaves you helplessly couch-locked with a moderate buzzing feeling that eases away any aches or pains and often causes you to fall asleep. Forbidden Fruit is ideal for experienced users suffering from chronic pain, insomnia, chronic stress, and migraines.